We as humans only have many things in common. We all eat, sleep, use the restroom and, usually, we all wake up after going to sleep. The alarm clock is a ubiquitous fixture in the bedroom and smartphones serve that purpose for a ton of people. Among so many of these alarm clocks available for your smartphone, choosing the best one is not that easy. To make the search easier, we looked and discovered a great music alarm clock you need to try. Let’s see what Deez Alarm Clock for Deezer Music is all about. What is this alarm clock app about? 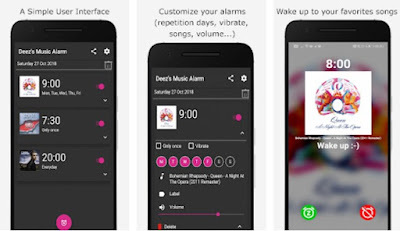 This amazing music alarm clock is developed on the Android platform for all users tired of waking up each morning to the same old annoying music. With this alarm clock app, the users are able to choose any music they like and set it as their alarm clock. The app is giving you the ability to choose any track, album and even playlist for your alarms and wake up to new music each day. Start your day the right way by choosing favorite songs, playlists, and albums to be set for your alarm clock. Why Deez Alarm Clock for Deezer Music? Deez Alarm Clock for Deezer Music is quite a unique offering you to play Deezer playlists and tracks as your alarm. With this alarm clock, you will have the ability to schedule your own wake-up time with a smart alarm clock and quickly search for any Deezer music you like to set it as an alarm on your phone or tablet. Use your favorite songs, playlists, and albums for your alarm. On the app you are also able to set alarms to repeat, playing them by preference each chosen day and setting specific songs for specific days you want, set it and forget it. Set your own waking up schedule on the app and use the snooze every time you want to stay a little longer in bed. You can even easily search for any Deezer music within the app and add even your favorite tracks for your alarm. Shuffle playlist, and use one touch to enabling and disabling options. The ‘’Wake-Up’’ playlist is available to be created by your choice so you can pick any music for waking up. Download this app now on Google Play for free to set your favorite music as your alarm each morning!